Glittering chandeliers, pastel accents and gleaming white marble. Forget granny armchairs and mis-matched cutlery – Creams is the polar opposite of your quintessential British tearoom. It’s glamorous. The first time I walked past it, I knew I wanted to go there. The brightness and lightness of the place shine out from its out-of-the-way location in the Core Shopping Centre in central Leeds. It’s not in a high footfall area, and although it’s never packed, it seems to be quite busy. The entrance area is more of a shop, with picnic hampers, teddy bears, and a counter to order take away food and cakes from. Towards the back is a seating area, with massive windows and decadent chandeliers overhead. It’s utterly photogenic. I’ve now visited Creams twice. Both times, unfortunately, there were a few issues. The menu proudly boasts of a tablet-based ordering system, but this wasn’t working either time we visited. We had to go up to the counter to order, which felt at odds with the “luxury” vibe of the place. Similarly, because serving staff weren’t around the dining room, it was difficult to get their attention if you needed extra cutlery or napkins. The menu is a little busy, with a lot of different options. Many of the food items don’t exactly scream “opulent tearoom”, such as the beef burger and fries. In addition, the toilets are pretty basic (just a single stall), and seem like a bit of an after-thought considering the glam of the main restaurant. The first time I went with TC and his mum, and we tried out their unusual afternoon teas. Rather than just your standard offering – finger sandwiches, scones and petit fours – Creams have three additional options. The “Eastern Emperor’s Afternoon Tea” features a chicken tandoori naanwich, samosas, and cakes, while the “Royal Arabian Afternoon Tea” includes either lemon pepper chicken, either as a salad or sandwich, then hummus, olives and pitta bread, and of course cakes. I was somewhat surprised that these two afternoon teas didn’t include scones, and so I knew I’d have to pick the final unusual option. The Italian Afternoon Tea kept the scones and little cakes, but swapped out the sandwiches for a margherita pizza. All of the unusual afternoon teas suggested alternative drinks to the traditional pot of tea, and so I had a cappuccino with my Italian feast. TC’s mum chose the Arabian Afternoon Tea. TC himself avoided the afternoon teas and went for Eggs Benedict followed by a waffle. Our afternoon teas were served traditionally, on a three-tier stand. My pizza was really tasty for a simple margherita, with halved cherry tomatoes on top and a side salad. Finally, the cakes. In my experience, this is always the most variable layer of the tea. I’ve had some outstanding cakes in my time, and Creams put up a good challenge. Two small chocolate beans, a strawberry cheesecake, a macaron (<3) and a surprisingly large cupcake, which was the highlight of the plate. There were a few different cupcake varieties: you didn’t get to choose, but I lucked out with a caramel one. It was covered in sweet buttercream, drizzed in caramel syrup and… filled with caramel too. I was almost too full for the cupcake by the time I ate it, but I’m glad I managed to! My second visit to Creams was with a larger group – TC, his mum, sister, aunt, uncle and cousin. Knowing I wanted something sweet for afters (though at that point I was torn between freakshake and waffle), I chose a lighter main. I ordered the lemon and pepper chicken salad. It was pretty massive for a salad tbh, and I definitely didn’t need a dessert afterwards… but I wanted one. Creams have three freakshakes on their menu. I didn’t think I could tackle the giant slice of cake that’s served on top of the Chocolate Monster Freak… So I went for the Tough Cookie Freak. My first freakshake was down in London, and it was a bit of a behemoth. So I felt a little bit let down when this one came out. Nevertheless, once I actually dug into it – through the cookies and cream cupcake that topped it – I was pleasantly surprised. The smaller size meant that it didn’t feel impossible to finish it. It felt decadent but not overwhelming. The taste of the milkshake itself was delicious – vanilla fro-yo with crushed cookies, toffee sauce and Nutella (I omitted the banana). The only downside was the cupcake was a little dry when I came to eat it. Overall Creams isn’t my definition of British Luxury. 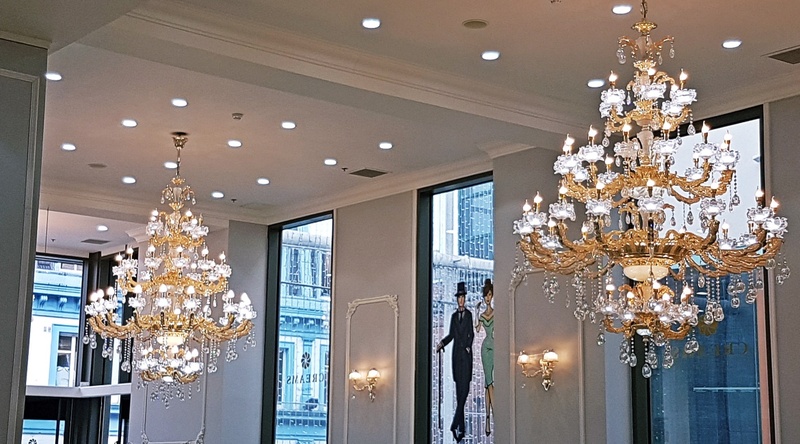 It’s certainly a nice tearoom – and very reasonably priced considering how opulent it looks – but it’s more of a cafe than a luxury experience. I’d happily take friends and family there again, but I’d warn them that some of the sparkle is only skin deep. Disclaimer: I visited Creams British Luxury last July, so the menu and service may well have changed since then.